Looking at security cameras online is one thing, but seeing them in person can be very helpful in learning about the different types of systems. We encourage our customers to try a system on for size first, play with it, see the differences between cameras and technologies and then make an informed decision about what will work best for your needs. This is why we opened up a fully stocked showroom near Naperville in Warrenville, IL. 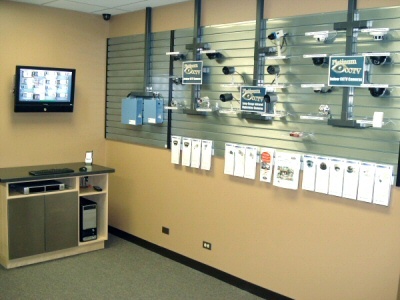 Stop in at any time to see all of the different cameras and systems for your home or business. Our security professionals can walk you through each type of system and camera, showing you live on the screen the real difference our Platinum CCTV™ systems can make for you and your business. Whether you are a security professional, installer or first time customer, you will surely benefit from our years of experience in the business. Looking at security cameras online is one thing, but seeing them in person can be very helpful in learning about the different types of systems. We encourage our customers to try a system on for size first, play with it, see the differences between cameras and technologies and then make an informed decision about what will work best for your needs. This is why we opened up a fully stocked showroom in Warrenville, IL we are right up the street from Naperville at the corner of Butterfield Road and Route 59. Need installation services too? Great! We offer a full suite of installation and maintenance services to provide you with installation, maintenance and service for your CCTV, HD-SDI or IP camera system. Call us up, and a representative can come out to meet with you quickly and assess your situation.